The last couple years have given us four comics adaptations of The Picture of Dorian Gray. 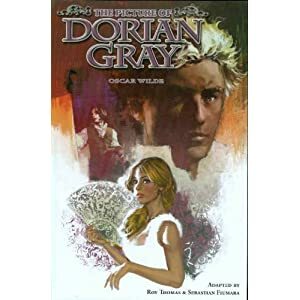 The first is a French volume, Le Portrait de Dorian Gray, d’Oscar Wilde, adapted by Stanislas Gros and published by Delcourt in June 2008. The second, the Marvel Illustrated edition, scripted by Roy Thomas and drawn by Sebastian Fiumara, appeared in hardcover later that year. The third, adapted by Ian Edginton and illustrated by I.N.J. Culbard, was published by Sterling just a few weeks after the Marvel edition. The fourth, appearing in a Graphic Classics collection of Wilde stories, was scripted by Alex Burrows with art by Lisa K. Weber. It was published by Eureka in early 2009. My half-remembered high-school French is sadly inadequate for the task of evaluating Stanislas Gros’ adaptation of Wilde’s prose, and in any case, I have only seen the portion of the book available as an online preview. But judging by first impressions, the Delcourt edition may be the most interesting of the set, at least artistically. The characters are portrayed with simple, somewhat delicate lines, and the backgrounds shown rather selectively — exactly enough to create a compelling setting, without becoming distracting or appearing cluttered. Some frames display entire rooms in careful, extensive, wonderful detail, while others simply show the characters, with no discernible image behind them. The portrait, in contrast to everything around it, appears as a gently sketched pencil drawing, entirely in blue. It is, in some ways, more naturalistic than the images of the characters proper, and yet it is also more clearly presented as an artistic creation. As for the American comics, all three stay reasonably close to the original in terms of plot, character, tone and outlook. The Marvel edition did a particularly good job abridging Lord Henry’s philosophical monologues without altering the feel of them, and without cheating on the ideas. In his introduction, Thomas expresses his anxiety about adding dialogue where it is necessary — for example, converting Wilde’s generalizations about theater performances into specific lines from specific plays. In the execution, however, he did quite well. The details he and Fiumara added were well chosen and do genuinely enhance the effect of the novel, rather than diminishing or detracting from it. The Marvel edition features classic, almost conservative illustrations, well suited to the Victorian setting. Like Dorian himself, the art moves effortlessly between the worlds of staid gentlemanly propriety, indulgent and poetic dandyism, and the seedy and dangerous poverty of industrial Britain. This entry was posted on Tuesday, May 18th, 2010 at 12:01 am	and is filed under Essay, History.